Why we might be seeing the end of Labor-Coalition consensus on ANZUS. Michael Fullilove is right to argue that ANZUS is bigger than any one individual, even when that person happens to be the US president. However, Trump's election has already affected the way Australian political leaders think about the alliance. Their disparate responses suggest that we are seeing the end of a long-held consensus between Labor and the Coalition. ANZUS may no longer be above politics. The alliance has enjoyed bipartisan support for over 30 years; it is easy to forget that it was not always so. Though Labor Left historically opposed it, the party’s mainstream sought to place ANZUS in a broader context that included a commitment to the primacy of the UN. In the 1970s Labor sought to radically reform the alliance’s role in our policy-making, and almost lost ANZUS when Whitlam clashed with Nixon. In the 1980s under Hawke, the ALP ushered in a new era of alliance bipartisanship by combining ANZUS with a more self-reliant defence policy and winning over the party’s left wing through an emphasis on Pine Gap’s role as an arms control mechanism. Since then, the only argument between the major parties on ANZUS has been which one loves it more. The election of Donald Trump appears to already be fracturing this consensus, with the Opposition Foreign Affairs Spokesperson Penny Wong calling for a broadening of Australia’s security options (including a deeper engagement with Asia), while warning that we are now facing the possibility of a very different ally in the US. Meanwhile the government appears to be doubling down, with Defence Industry Minister Christopher Pyne reassuring the US that Australia is no 'strategic bludger' and will pull its weight on defence spending. There have been bumps in the road before this. The brief and unhappy tenure of Mark Latham comes to mind, as does the Iraq War and John Howard’s ill-judged comments on Barack Obama in the lead up to the 2008 US election. In the long run these all proved insignificant, but we are now faced with something more serious. In the election of this new and controversial US president, we have the possibility of real political division over ANZUS. Furthermore, the real chance that Australia's recently announced refugee swap with the US will be rejected by the incoming Trump administration introduces a dangerous variable that could complicate the bilateral relationship and draw it in to our domestic politics. Of course bipartisanship over ANZUS is not all good, as Paul Keating reminded us last week. At its worst, a broad political acceptance of the alliance as a sacred cow not to be questioned or debated, with the expectation that it will grow ever broader and deeper, risks stagnation. Few parliamentarians think about ANZUS deeply, and that is not to our credit. The relationship should be a one that is contested by politicians, as well as commentators and the public. It should be open to criticism and refinement. However, ANZUS should not feature in the fray of day-to-day politics. Unfortunately for the government, starting off the relationship with the incoming administration with a transactional matter so controversial to both countries risks doing just that. The deal announced by the prime minister on Sunday is with the Obama administration, and it seems likely the exchange will not be completed before the president leaves office 20 January. Various US immigration experts have expressed scepticism that Trump will honour the deal. Herein lies the risk for the Government and for the bipartisan alliance relationship more broadly: if the deal is honoured and finalised it will a great success for Malcolm Turnbull's government, but should the incoming administration raise objections to it ahead of the transition or decides to cancel the arrangement upon coming to office, Turnbull will be faced with a failure he cannot afford. While Immigration Minister Peter Dutton expressed with startling certainty that 'the Trump administration will respect the fact that this is a very important issue to the Australian Government', it appears as though Australian officials negotiated on the assumption of a Clinton victory. The government now finds itself hoping Trump will see his way to making an exception for Australia, despite his anti-immigration rhetoric. The opposition would undoubtedly be quick to criticise any failure on this front. The prospect of our bilateral relationship with the US being caught up in our domestic political debate, especially the toxic discourse around asylum seekers, is troubling. If the deal flounders, it threatens to do just that. We have already seen some politicking on Trump from both sides. In the lead up to the US election, both Labor and Liberal MPs (including Labor leader Bill Shorten) criticised Trump in colourful terms. The temptation for both the prime minister and the foreign minister to score the easy political point proved too great, with Julie Bishop arguing that Shorten’s claim that Trump is 'barking mad' proved Shorten is unfit for office and Turnbull rebuking him for acting against the national interest. 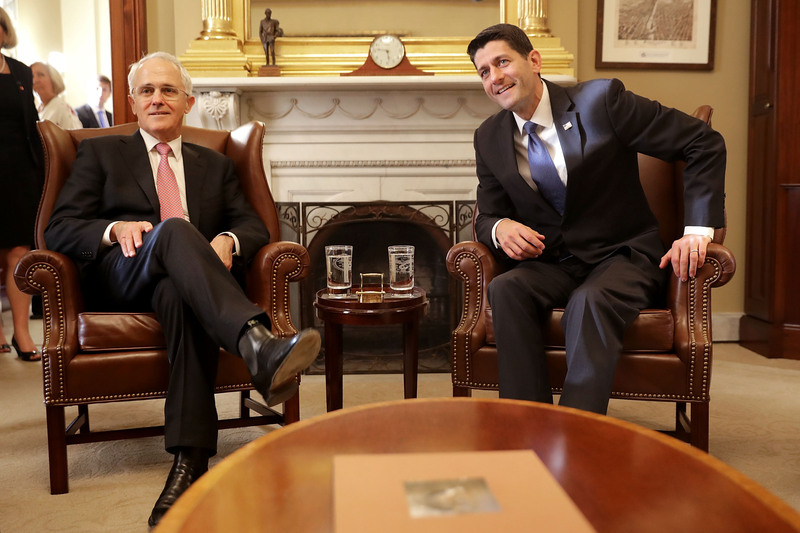 Correct though Turnbull may have been, seeking to make political capital out of the situation was unwise as wedging the opposition on Trump cannot be good for the alliance relationship. As Fullilove points out, the benefits of ANZUS to Australia are clear and enduring. Less clear is Trump’s perception of how it benefits the US and his precise expectation of our contribution to the alliance. It's also unclear whether Australian policy makers are in agreement on the nature of that contribution or even whether they've given the matter much thought (beyond the usual niche contributions to US-led operations). In the coming months Trump will say and do things that are extremely controversial. The fashion in Australian politics today is for leaders to comment on almost everything put to them by journalists and to then comment on their opponents’ comments. If Trump becomes a regular fixture in this, it will be a very long four years with some awkward moments for all concerned. It would be easy for the Government to lapse into a 'pro-alliance equals pro-Trump narrative' and for Labor to react to this. This is the stuff media advisers relish; the talking points almost write themselves. Though the short-term political gains might be tempting, they are outweighed by the long-term risk to ANZUS bipartisanship. Political leaders engaging more deeply with ANZUS is welcome, as it raises the possibility of an alliance that better reflects Australia’s interests. However, the Trump ascendency and reactions to it threaten to draw the relationship into our own political squabbling. In the long run this will not serve any of Australia's interests. Will the Trans-Pacific Partnership be a good deal for Australia? Highlights from The Interpreter on the big economic story of the year. The sky is falling again: should we worry? The risk from large satellites hitting Earth are low, but not zero, and the world needs to do more to ensure the safe disposal of space infrastructure. The international financial system is significantly different to the one that existed when the IMF and World Bank were established.